MANSFIELD — In 2018, a total of forty-two (42) inmates worked in the Richland County Sheriff’s Inmate Community Work Program. They logged 4,314 hours, saving the county close to $65,000 in labor costs. The work this crew does, under the supervision of Officer Keith Witzky, benefits Richland County and its townships and affords non-violent offenders the opportunity to get out of their jail cells and do meaningful work. This team provides extra manpower for the county building maintenance department as they help with special projects at county facilities. For instance, when a department moves or remodels, this crew does all the furniture moving. They also shovel snow and spread salt at county buildings. At times, they help with painting projects as well. Dayspring, the county home, uses these workers to help with yard work, cleaning, moving furniture, and other projects. The work crew generally spends a few hours a week at the Fairgrounds helping prepare for weekend events and assisting with maintenance issues there. The Senior Center in Lexington called on this group to help move and arrange furniture and other items for their rummage sale. The work crew also painted the fences at the ballparks in Ontario. 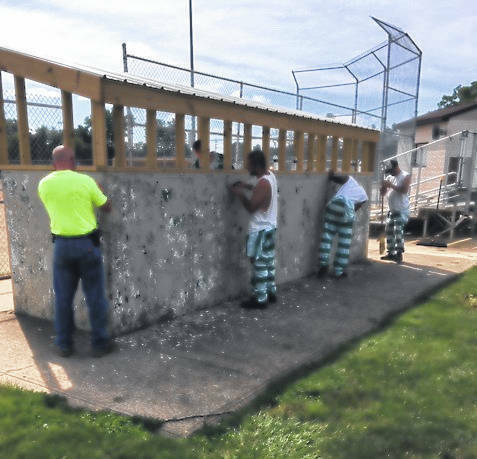 Lucas, Lexington, Ontario, and Shelby all call on the inmate work crew from time to time, as do Franklin, Jackson, Madison, and Weller Townships. The crew helps with road work and cemetery maintenance, doing dry patch, guardrail maintenance and weed control.